Dr. Gisela Padilla-Concepcion is recognized for her significant contributions in the field of marine natural products. With students and co-workers, she led researches that: isolated, purified, identified and characterized marine natural products with anti-cancer, anti-bacterial, anti-tuberculosis, antimalarial, anti- inflammatory and immuno-suppressant properties; developed innovative and inexpensive bioassay methods for platelet inhibition and other bioactivities; and developed targeted drug delivery systems for efficient and effective immunosuppression and anti-cancer treatment. 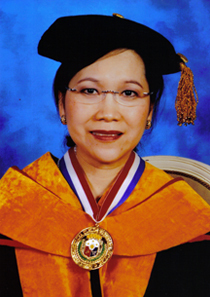 Dr. Padilla- Concepcion has mentored graduate students and research associates and imbued them with the passion to pursue scientific research. She has demonstrated inspiring leadership in the campaign to promote and increase government support for Science and Technology in the country.